Worship: Regular Sunday worship at starts at 9:00 a.m.
March 17th - 1 pm CLPPC board meeting at Trinity. It is Sandwich Sunday and potluck birthday celebration so Pierceland attendees are welcome to come early for lunch! 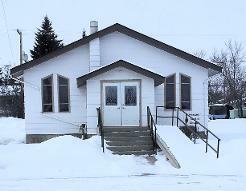 Choir practice We practise most Wednesdays, 7:00 p.m.
2019 United Church Calender's for sale, $8.00. Please contact Lillian Balazs at 780- 594- 3155 if interested.